The quintessential British blend, beautifully balanced with flavours of bergamot. 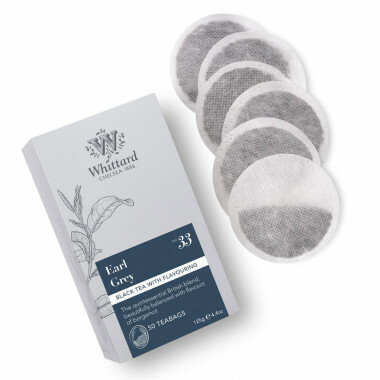 Whittard’s take on the quintessential British blend of fine Chinese and Ceylon black tea is perfectly balanced with flavours of bergamot. Renowned for its wonderful bergamot aroma, Earl Grey has become firmly ensconced as an afternoon tea classic. The story goes that the iconic blend was specially created for Charles Grey, 2nd Earl Grey, in reward for saving the son of a Chinese mandarin from drowning. When his supplies of the tea had run out, the earl commissioned British tea blenders to recreate the taste. As Prime Minister between 1830 and 1834, the very same Earl Grey presided over the Slavery Abolition Act in 1833. Whittard has numbered this tea 33, to mark the date. Use freshly drawn and boiled water. Allow to brew for 3-5 minutes according to taste. Can be enjoyed with or without milk.